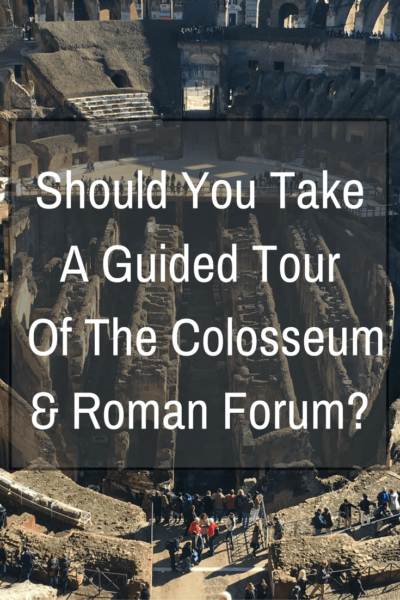 Should You Take a Guided Tour of the Colosseum and Forum? 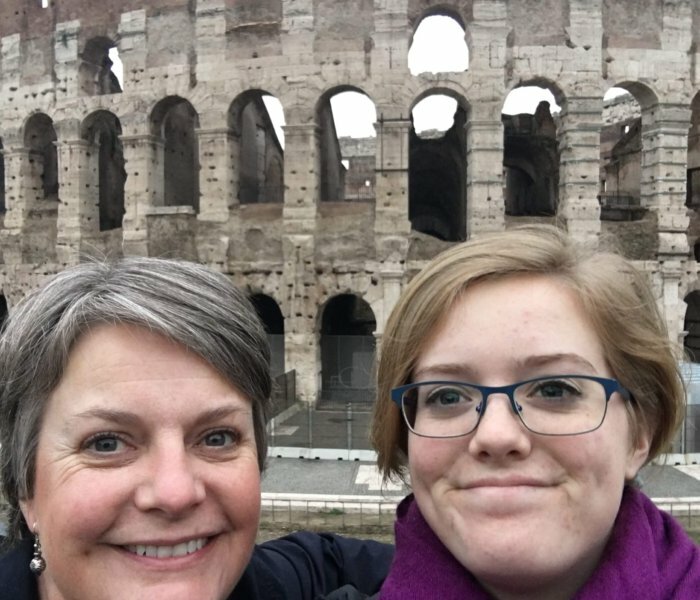 When planning a trip to Rome, I have found myself asking the question of whether we should invest the extra money on a guided tour of the Colosseum and Roman Forum? Is it worth the extra money? Is the information different than what you would find in a guide book? Do you have access to different areas? Do you have to wait in line to get in? I’ve visited Rome three times now. 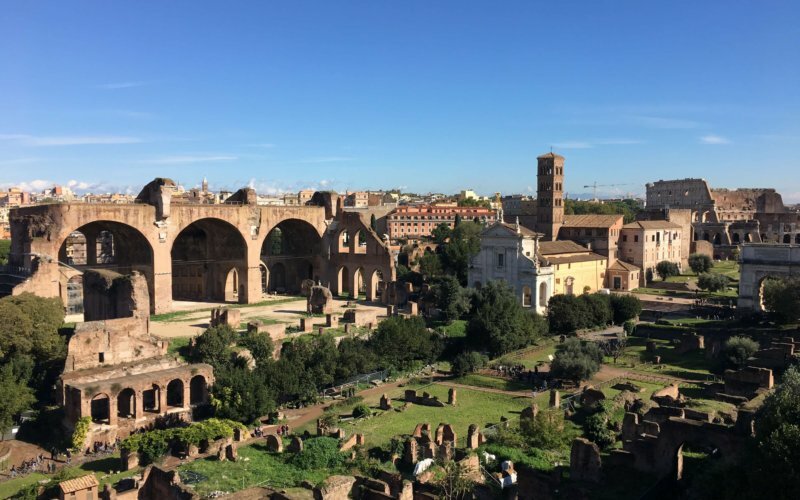 Each time I’ve explored the Colosseum, Palatine Hill and the Forum, I’ve used a different methodology to explore these famous sites. Which is best: Guide book, random tour, or pre-booked tour? On the first visit, I explored the area without a guide. I ‘winged it’ with a Rick Steves’ guide book. Obviously, first you need to buy the book. They’re not cheap, but they are an excellent resource. But, it’s bulky to lug around and cumbersome to find exactly what you are looking for at the time you need it. These days, podcasts are available to download ahead of time making it easy to use as an audio guide. The presentation in both tends to be a bit dry, but they provide a handy reference for later. 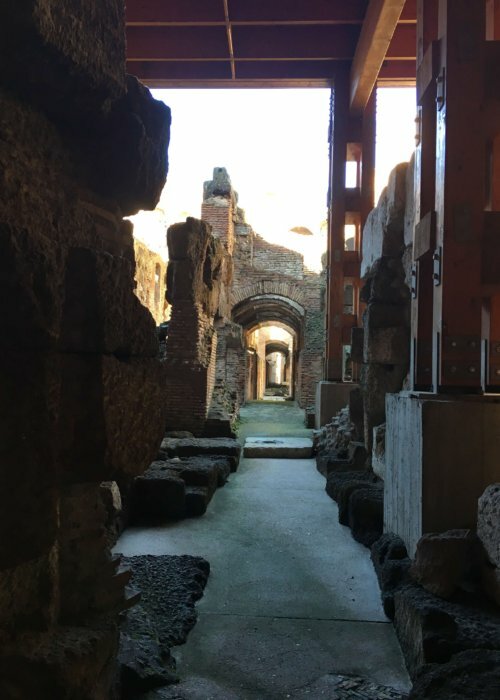 On the second visit, I decided to take a tour offered by one of the many vendors poaching their customers outside of the Colosseum. Our guide didn’t provide anything more than Rick Steves’ guide book did in terms of historical significance. But, I found him to be far more entertaining. We heard a local’s point of view on things and he answered any questions from the group with enthusiasm. In fact, I still remember the first guided tour I went on of the Colosseum with our guide ‘George. Like George Clooney but only better looking’. He loved bagging on the Gladiator movie, telling us about all the technical inaccuracies of the movie. I haven’t been able to watch that Russell Crowe movie since. For the third and most recent visit, I pre-booked the “Colosseum Underground Tour” with The Roman Guy. 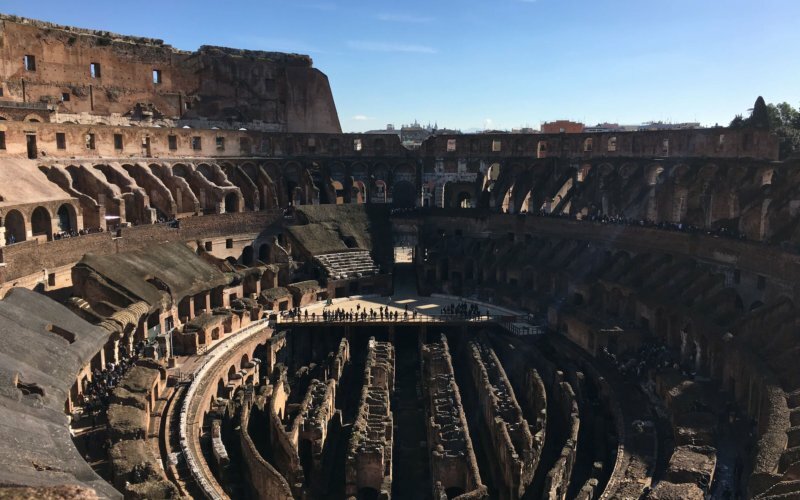 With the Colosseum Underground tour, patrons can experience the VIP-only access to the Dungeons and the top level, in addition to the rest of the public areas offered to everyone else. The newly constructed replication of the elevator was available for us to see. The elevator brought the animals and gladiators up to the arena’s surface. We got to see where the animals were held before being brought into the ring. In our imaginations, we could hear the roar of lions chained to the walls of the Dungeon. The scent of blood thick in the air. You can’t get that from Rick Steves or the poachers lurking outside the Colosseum. The guides speak English clearly, which is helpful as you are zipped from area to area. They can answer questions you may have easily (if you aren’t too much of an Ancient History Nerd). And you gain access to VIP sections that the public generally does not have access to, which in my opinion, is worth the price of the tour. While we still had to battle for space in some areas, we skipped the long lines when we entered the Colosseum. Depending on the season, it’s worth the ticket price right there. As mentioned, we also had access to VIP areas that others did not. With that, you could feel glares on our backs as we were taking behind roped off areas. (I had to secretly smile at that, I have to admit!). Our guide was lovely. Raffa was well versed on her history and enthusiastic. But, traveling with an Ancient History nerd, we felt like the information she presented was a bit shallow. I guess it’s fair to say that this is a great tour for the general public. My Ancient History nerd whispered to me her own insights, out of earshot of our lovely guide. I guess that is why Nat is writing “The Geek’s Guide to the Colosseum and Roman Forum” for our website. Don’t get me wrong: The “Colosseum Underground Tour” with The Roman Guy was interesting and informative over all. I’m always eager to understand how life was lived in those ancient days. If the guide can introduce some humour, it’s all the better. Guides seem to especially love pointing out the blunders that Hollywood movies make to add dramatic effect. For example, the thumbs up/down motion on whether to kill off the gladiator from the crowd. The arena was so big that there’s no way the Emperor could see what the audience had requested, so it was more likely an arm in the air and a chant to determine the hero’s fate. 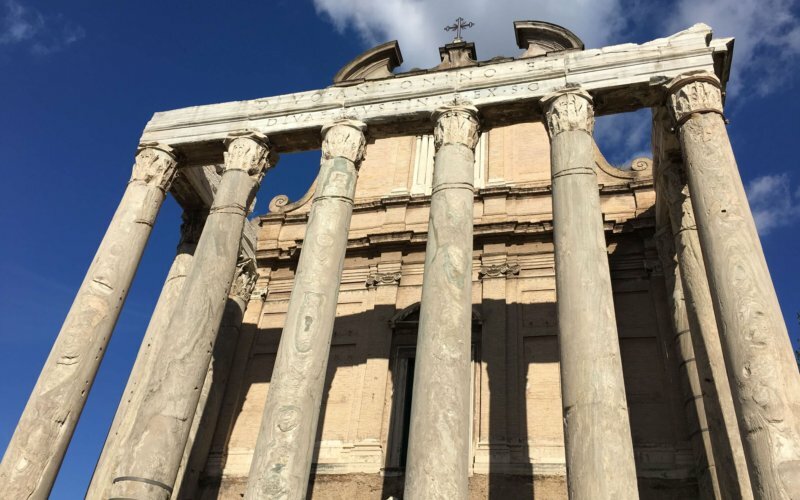 Even with a tour, history buffs may be disappointed, especially with Palatine Hill and the Roman Forum. Both tours that I’ve been on have glossed over these areas. In all fairness, most people are primarily interested in the Colosseum, and the tour operators know this. Besides, these areas are easily explored on your own. It’s particularly beautiful to stroll along the Forum as the sun goes down. 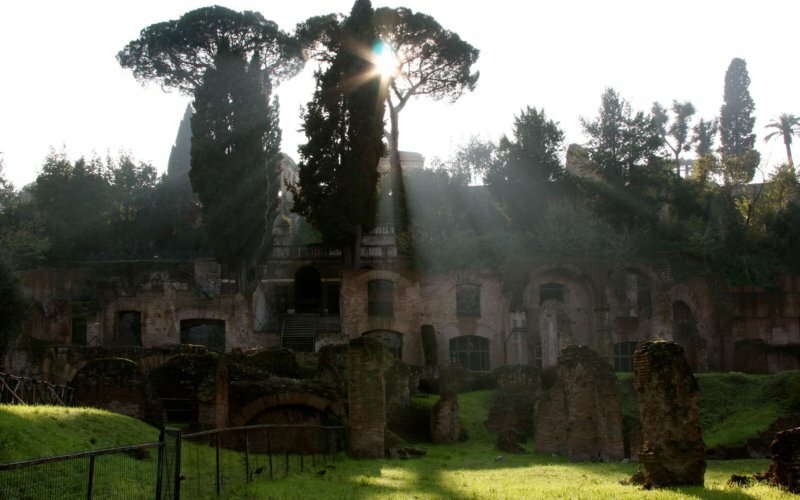 From here, you can watch the Colosseum light up in all its glory. After taking a few guided tours now, they are worth the money. Truly. You gain access to areas that are not available to everyone. You get the folk lore from a local guide. You also get humorous anecdotes if your guide is good. 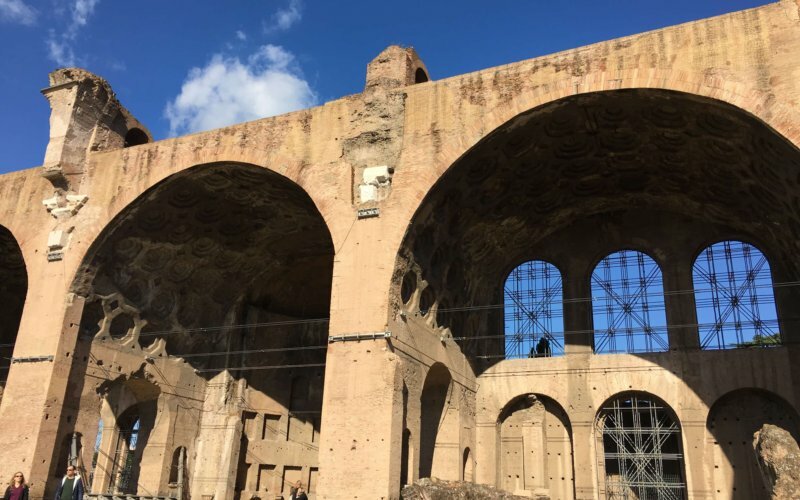 Guided tours are memorable experiences worth investing the money and for Rome, The Roman Guy tour is worthwhile with the Colosseum Underground Tour. NOTE: This was a sponsored experience and one we sought out ourselves. We do not promote any brand we have not used or experienced for ourselves. All opinions are our own. Please follow our advice at your own risk.